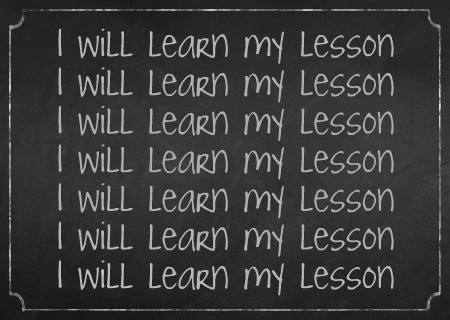 I find myself reflecting a lot this week on the concept of learning lessons, and where the phrase “I hope you’ve learned a lesson” originated. It has always felt like a scolding of some sort to me. So, I did a Google search to see what the Internet had to say, which only confirmed the connection I was making to being scolded. The FreeDictionary.com’s definitions included the phrases “bad behavior” or “unpleasant experiences” (what the dictionary.com had to say about it). Yes, this does mean that I had an encounter recently with this lovely idiom (it usually surfaces about this time of year), and my experience reminded me of what Derald Wing Sue shared at the Lilly Conference this fall (2013) regarding microagressions. I was left with the feeling that the other person was trying to put me in my place. Yes, I have many new things to learn about in life, but there are also things I have already learned and new experiences only deepen that learning. This experience is contributing to the deepening kind of learning, and has often occurred in my life because, as someone once said to me, “I don’t show full respect for the privilege others have”. Don’t take that mean that I go around like a bull in a china shop because that is not the case. That wouldn’t do any good even if I wanted to do so. I own that I am still exploring what it means for me to “not respect the privilege others have” given that I have privileges myself (and I probably always will be exploring this, but I will save that for a future post :)). I do believe that this most recent experience, and these reflections about it, are a part of that exploration. Much to sit with. I also think the phrase “I hope you learned your lesson” is supposed to elicit feelings on my part…where I am supposed to feel bad that what I did is now causing troubles for other people. And I often do dislike greatly the amount of time and energy that is spent dealing with such situations (yes, it would be so nice if such experiences never happened), but I don’t believe that I am intentionally trying to be difficult. Rather, I am being me, and yes, I can be asked to be incongruent with who I am, and I often am asked just that (please note, these are rarely formal requests), but there is a cost for me to do so, thus the decision is not an easy one to make. It never really feels like the phrase “I hope you learned your lesson” acknowledges that cost. And then what do you do if in staying congruent to who you are there is a cost for others? It can be tough stuff to navigate. Again, much to sit with. I share all of this because it is on my mind, and also because I work in the field of education, which means that there are often “lessons” we are supposed to want others to learn. And in reflecting on those lessons, I can’t help but hear a connection to what James Zull (2002) calls the “Teaching Trap” in his book The Art of Changing the Brain. Essentially, Zull discusses how learning is always happening, but the question we should be asking is if the learning we want to be happening is the learning that is occurring, or is something else really being learned? This entry was posted in Uncategorized and tagged Derald Wing Sue, experience, unpleasant experiences. Bookmark the permalink. This post has me reflecting upon my intentionality when working with students. It also hits close to me recently because of discussions I have had to have with students I supervise regarding their job performances. I often times think through my mind how easy it would be to say, “You did this wrong and so I want you to fix it this way.” For me that translates to, “Your behavior does not meet my expectations and therefore this is how I want it corrected.” Somewhat similar to, “Did you learn your lesson?” Therefore, I often take time to reflect on how I am feeling and why the situation has affected me. Just how personal am I making it? What is it that I am about to teach? …am I teaching about myself and my standards? Or am I truly engaging myself with the other? This topic/discussion as a whole has me in a waltz as I reflect back to myself as a supervisor and also as a supervisee.